It’s that time of year. V-Day. The time for decking the halls with flamingo-pink stuff and stocking up on painted roses and hoarding homebrand heart choccies and—stop right there. Thanks to Oriental Teahouse, this V-Day is going to be different: cocktail-fuelled, sans cringe and all about double D’s. Dumplings and dating, that is. 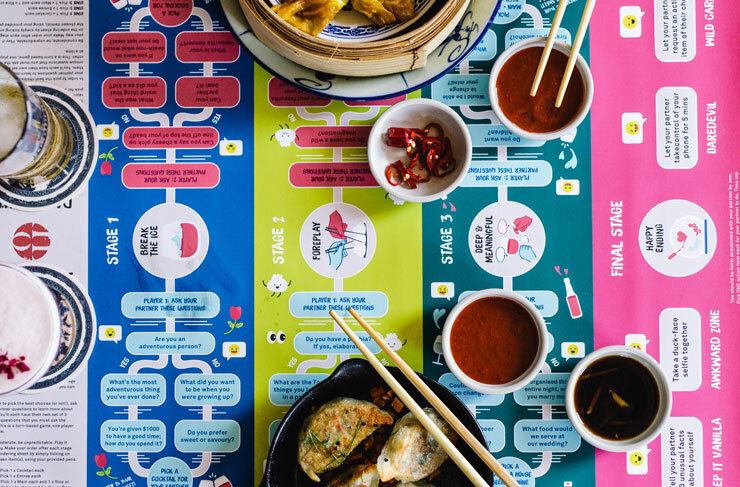 If (like Khalid) you’d rather be a lover than a fighter on February 14, grab your SO and gear up for a “getting to know you” board game night at Melbourne's favourite dumpling digs. Couples new and old will partake in a boozy questionnaire designed to make it a date night like no other. Basically Oriental Teahouse has designed questions for couples to get to know one another...and then added dumplings. Don’t worry, there'll be copious amounts of dumplings in play to soak up those cosmo's and avoid any embarrassing ‘So what are your top 3 baby names?’ disaster q’s. Be prepared for Chilli Wagyu Beef offerings to turn up the heat, and who knows, maybe even force your dreamboat to hand-feed you some Chocolate Wonka dumplings for dessert. Game on. Already made plans for the big day? Still waiting for Chris Hemsworth to respond to your twentieth Insta dm? Don't worry—the questionnaire game will be sticking around all year long. Resuuult. Did you know there’s a pub in Melb doing Vegan ‘double down’ burgz right now? Find out more here.